If your little one has been looking for the perfect way to spend countless hours in the house, then this Large 3-Level Wooden Doll House is the perfect answer for their needs. 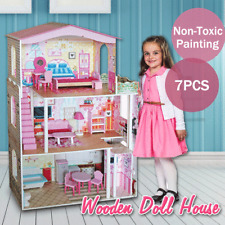 This wooden doll house is simple to assemble and uses non-toxic paint which is safe, tested and approved. This dollhouse makes a great craft project and gift for both children and collectors! This dollhouse features. them into this dream house! Just follow the step-by-step illustrated instructions and have fun! 1 x DIY Hawaii Villa Wooden Miniature Dollhouse Kit (Glue and Battery are not included). 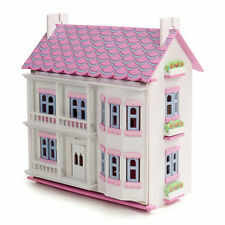 -This dollhouse makes a great craft project and gift for both children and collectors! Assembly Difficulty Level: 3. OZ DIY Wooden Doll House Miniature Kit Ancient Architecture Dollhouse Toy Gift. AU DIY Wooden Doll House Miniature Kit Ancient Architecture Dollhouse Toy Gifts. Music Wooden Dolls House Doll House DIY Light Miniature Dollhouse w/ Furniture. This is a loft style DIY Dollhouse, very layered. Needs to be assembled by hand, and the production process is more interesting. There are LED lights in many places, will performs better in the night. DIY Wooden Doll House Miniature Kit Architecture Dollhouse Toy with LED Light. 1 set DIY Dollhouse. DIY house is the miniature of real house, cute and beautiful. The following handcraft tools you will need (not included):paper scissors,small knife,hole maker,precision tweezers,ruler.mini screw and hight quality adhesive. Children can DIY and enjoy miniatures with this beautiful doll house. 1 x DIY House Set. It is NOT a pre-made dolls house,but more of a DIY handcraft miniature project. Children and the young can build this item with parents or they will find assembling these kits difficult by themselves. This dollhouse makes a great craft project and gift for both children and collectors! This dollhouse features. caused by many factors such as brightness of your monitor and light brightness. Assembly Difficulty Level: 2. 1x DIY Dollhouse with Instructions and Accessaries. Light:LED light. (Battery, dust cover and car are not included.). The products do not include all the accessories in it. The products are subject to actual receipt. Use AA batteries(not included), without glue. 1 x Love Fortress Wooden Assemble Building Model House Valentine Christmas Gift DIY. This is a wooden house model design. You can give full play to your imagination, so to create your ideal lovely house model. This dollhouse makes a great craft project and gift for both children and collectors. 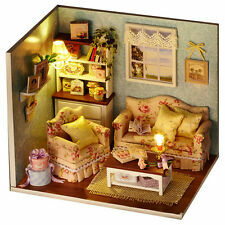 - DIY house is the miniature of real house, cute and beautiful. - 1 x DIY Doll House Set. - It's easy to finish it following the instruction, just need enough patience. 1pcs DIY House Set. Material: wooden cloth material plastic. LED lights. Application: Decoration, gifts. (E.g. you brought wrong model or wrong color). Seriously promise. DIY Wooden Dollhouse. DIY FUN! Tin Box Series. Wall Stickers. Wall Mounted Decorative Shelve. Wall Clocks. Dream House Series. Small Furniture. Cherry Tree Hall has 4 levels with 3 levels connected by staircases and the top level is a loft level that can be accessed by lifting the roof. Each room has different wall decorations which define room space. Type: DIY Dollhouse Box (It's NOT a finished model. You need to assemble it by yourself.). 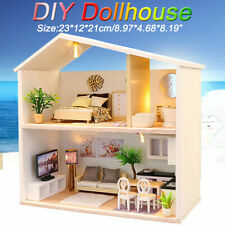 1 X Modern House DIY Dollhouse Kit. This item is a DIY product, what you will get is just kits and accessories! 1 set DIY Dollhouse. DIY house is the miniature of real house, cute and beautiful. It's romantic to send it to friends, lover, family, kids. The following handcraft tools you will need (not included):paper scissors,small knife,hole maker,precision tweezers,ruler.mini screw and hight quality adhesive. DIY house is the miniature of real house, cute and beautiful. 1X DIY Room. Finished House Size: (L)X(W)X(H)21X12.5X14.5cm/8.27"X4.92"X5.71"(appr.). It's easy to finish it following the instruction, just need enough patience. DIY house set 1. Material: wooden cloth plastics. Use AAA battery(not include batteries), but not include glue or authoring tools. Product size with the box(approx.). : 30.3 7.6 26.2cm/11.93 2.99 10.31in. DIY Wooden Dollhouse. DIY FUN! Wall Stickers. Wall Mounted Decorative Shelve. Wall Clocks. Tin Box Series. Small Furniture. We will try our best to assist you as soon as possible. Dust guard. Material: Wood, cloth, plastic. LED lights. Application: Decoration, gifts. Material bag. Color instruction book. Use AAA batteries (. Size:15.1 11.6 13.1cm / 5.95 4.57 5.16 in. ). 1pcs DIY House Set. Material: wooden cloth material plastic. LED lights. Application: Decoration, gifts. Note: AAA battery (without battery), without glue. Product Size: 30 23 22cm / 11.81 9.06 8.66 in. AU DIY Wooden Doll House Miniature Kit Ancient Architecture Dollhouse Toy Gifts. OZ DIY Wooden Doll House Miniature Kit Ancient Architecture Dollhouse Toy Gift. Music Wooden Dolls House Doll House DIY Light Miniature Dollhouse w/ Furniture. Imaginative play time is a great way for your children to encourage their own development. Being an active participant in their own play, rather than passively sitting in front of the TV or computer, can help kids increase their imagination and improve their problem solving skills. 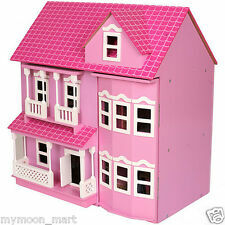 Ignite your child's ingenuity with the great range of wooden dolls house available right here on eBay. With their a house for their dolls and toys to live in and explore, your child will spend many happy hours playing, and the best thing is, you don't even have to leave your own house thanks to the magic of online shopping. Wooden doll houses come in variety of styles, options, and colours, so you can find the house to suit your child and the space available. From a smaller house suitable for one or two dolls, to elaborate mansions taller than your child, a wooden dolls house is a great addition to any bedroom. The house can also provide extra storage for your child's dolls and other toys when it's not being played with. Wooden houses may come pre-assembled, or you may prefer to find one that you can assemble with your child as a fun project to work on together. There's a wide range of accessories also available for doll houses, including matching wooden dolls, furniture, belongings for the dolls like paintings, books, cutlery and crockery, wooden food items, even battery operated lights and lamps for a realistic home experience. The house and accessories are wonderful gifts that you can keep giving your child for birthdays, Christmas, and so on. While you're considering the type of wooden dolls house to suit your child, don't hesitate to check out the full range of doll houses, including the range of Edwardian doll houses. Whatever the wooden dolls house to suit your needs, your child is sure to enjoy all the options available right here on eBay today.